Pentax has added another tiny sensored compact system camera (CSC) to its lineup. However, the Pentax Q7 uses a 1/1.7-inch device, which is larger than the Pentax Q10's. The resolution of the Pentax Q7's sensor remains the same, at 12.4 million pixels, despite the increase in size. All existing 'Q' mount lenses remain compatible with the camera, though it should be noted that equivalent focal lengths will be different given the larger sensor size. Whereas the Pentax Q10 has a magnification factor of 5.5x, the Pentax Q7's crop factor will be 4.6x. The camera also features a new Q imaging engine, while the sensor doesn't feature an anti-aliasing filter. Pentax will keep the Q10 in the lineup, offering the Q7 as a more "premium" version of the camera. Other features on the Pentax Q7 include an electronic level, a programmable quick dial and Eye-Fi compatibility. Pentax is also launching a new lens for the Q range. The new "mount-shield lens" has a basic design of one element and features a fixed aperture of f/9.0 and an equivalent focal length of 53mm when attached to the Pentax Q7, or 63.5mm on the Pentax Q10. The new addition brings the total number of proprietary lenses up to seven, with existing K-mount optics being mountable via an adaptor. 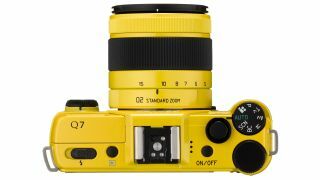 Both the Pentax Q7 and the new Q lens will be available from September, with pricing yet to be confirmed. This being Pentax, the Q7 is naturally available in a wide range of wacky colours, including up to 120 different colour combinations that can be made to order.